China, more than 2000 years ago: Welcome to the Era of Warring States! Prepare to colonize the Chinese hinterland, found provinces and absorb remote villages into your empire. As you expand, you build magnificent pagodas as a sign of your authority. The first to build all his pagodas wins the game. 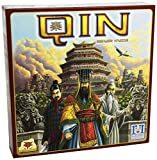 Dynasty by building your last pagoda! Each tile shows 2 province spaces. There are 3 types of province spaces: red, yellow, blue. Put the game board in the middle of the table. You can choose which side to play on. For the first game we recommend that you use the "Bird" board. Before the first game, carefully detach the tiles from the punch sheets. Shuffle the tiles. Give each player 3 face down tiles that he takes into his hand. Place the remaining tiles in several face down piles next to the game board. Place the pagodas of your color in front of you so that every player can see them. Return any spares to the box. The youngest player starts the game. Then play continues in a clockwise direction. The tile may only be placed onto grassland spaces (never onto province spaces, villages, or waters). At least one province space of the tile must share an edge with an existing province space of any color (villages are not considered province spaces). You may rotate the tile (aligning it horizontally or vertically). By placing your tile, you usually trigger one or more events that you must carry out: 1. Found province, 2. Expand province, 3. Create major province, 4. Connect village, 5. Conquer village, 6. Absorb province. By placing your tile, you can create new provinces. A province is any contiguous area consisting of 2 or more same-colored province spaces. Onto each newly founded province you place one of your pagodas as a sign of your authority. By placing his tile, Purple creates 2 new provinces (one yellow, one red). He puts one pagoda onto each of them. By placing his all yellow tile, Purple creates a yellow province that comprises 3 province spaces and places one pagoda onto it. You expand a province when you place at least one space of your tile adjacent to an existing province of the same color. You may place your tile in a way that neither a new province is created nor a province is expanded (because only 2 single province spaces form). However, this is seldom advantageous. As soon as a province comprises at least 5 province spaces, it ranks as a major province. Its owner indicates this by building a double pagoda (by putting a second pagoda on top of his existing pagoda). Major provinces can grow to any size but can accommodate a maximum of one double pagoda. Because of the newly placed tile, Green's yellow province comprises 5 spaces. He marks this major province by put- ting a second pagoda on top of his existing one. If, after you have placed your tile, the province or major province of any player shares at least one edge with an unoccupied village, the owner of the province seizes this village by placing one of his pagodas onto it. (No vil- lage can accomodate more than one pagoda). Tip: You should preferably connect unoccupied villages to your own provinces and major provinces. Also try to avoid letting the next player connect a nearby village to one of his provinces. Green founds a blue province. In doing so, he also connects to an unoccupied village. Since he connected the village to his own province, he seizes it himself. A village can change ownership when several provinces adjoin it. If, in the village's ad- joining provinces and major provinces, any player has more pagodas than the owner of the village, that player seizes control of it. The previous owner takes his pagoda back and the new owner puts one of his pagodas onto the village. When determining the majority, each double pagoda counts as 2 pagodas. The pagoda on the village itself does not count. General rule for connecting/conquering villages: As long as two or more players have the same number of pagodas adjoining a village, this village is not seized/conquered. Green founds a red province adjacent to the village: Because of this more Green pagodas (2) adjoin the village than White pagodas (1). Green conquers the village. Green expands his yellow province and thus creates a major province. Due to the newly formed double pagoda, Green has now more pagodas (2) adjacent to the village than White (1). Green conquers the village. By placing your tile, you can join separate provinces of the same color together, forming a single major province. The player with the highest total number of province spaces in the original provinces seizes control of this new major province. (Don't count the province spaces on the tile that joined the original provinces together). All dislodged pagodas are returned to their owners. Important: You are not allowed to join provinces together when two or more players would bring the exact same number of province spaces to the newly created major province (because no owner could be determined). Also important: Major provinces are safe! They can never be absorbed. You are not allowed to combine two or more major provinces. However, a single major province may still absorb small provinces. Green combines his red province b with White's red province a. Since province b is larger than province a, Green seizes the newly formed red major province and in addition the adjacent village. Green combines his red major province b and his red province c with White's red province a. Green brings 7 spaces to the newly formed major province and White only 2. Green seizes the newly formed red major province and White must remove his pagoda. Since each major province can only accomodate one double pagoda, Green must also remove his pagoda from the original province c.
Green is not allowed to combine the provinces a and a b, since Green and White would bring 2 province ' spaces each to the newly formed major province. This way the new owner could not be determined. At the end of your turn, you draw one new tile from any of the available piles and put it into your hand. Then it is the next player's turn. If all piles are exhausted, you cannot draw a new tile and must get by on the remaining tiles in your hand. The game ends immediately when a player places his last pagoda onto the game board. This player wins! The game also ends when all players have run out of tiles or when there are no adjacent grassland spaces left on the game board where a tile could be placed. 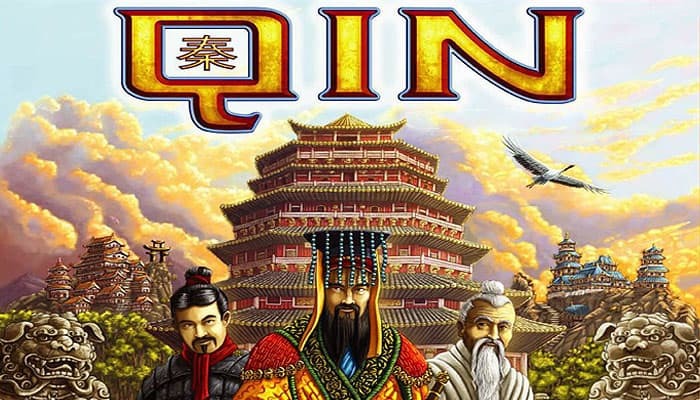 In that case, the player who has placed the most pagodas on the game board wins. In the case of a tie, the victory is shared. If you like, you can play a series of games (one on each board, for example). 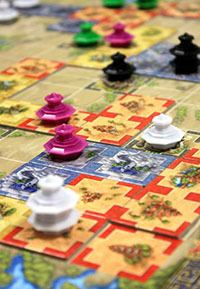 At the end of each game, note the remaining pagodas for each player. After you have finished the last game of the series, the player with the lowest overall number of remaining pagodas wins.